SIMPLY ENTER YOUR INFO BELOW TO JOIN TROPICAL SUNSATIONS - SUN CLUB! We'll never share your email. You can opt out at any time. Join our SUN CLUB today for exclusive deals, discounts and offers that will save you money. Sign up now and we'll even send you $5 off your next purchase! Tropical Sunsations Hamilton is proud to present the King 420. Now you can maximize your tanning potential in ONE TAN and do it WITHOUT BURNING! 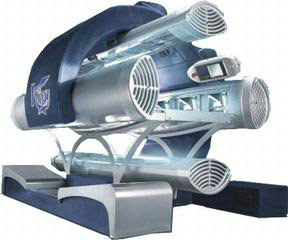 This one-of-a-kind high-pressure bronzing bed is the most powerful in its class this side of the GTA. Its contoured acrylic offers comfort while its open concept, 360° air conditioned interior offers luxury. This gentle giant has 22,400 watts of pure bronzing POWER: 1 Session in the King is equal to 6 sessions in Level 1. All this power and yet so gentle it is perfect for ALL skin types.